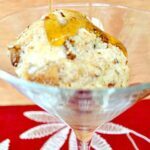 This ice cream balls recipe is made with ice cream to keep you cool during the hot summer, but the maple syrup drizzle will give you some warmth, too. An early morning caravan of orange buses has replaced the continuous stream of kids soaring past my house on bikes. In defiance of the sticky Florida sun, I feel a tiny chill this morning and am considering heading to Target for some maternity jeans. But I feel lazy. I think I’ll just pull on a pair of my hubbie’s sweats and snuggle up with a cup of tea and this month’s book club selection. Until I get the urge to go mix up a bottle of Guinness with some beef broth in a large roasting pan. I’ll plop in a big seared chuck steak, an onion, some carrots and a pile of mushrooms. Cover and simmer till dinnertime. Or maybe I’ll make a steaming pot of chili, garlic toast on the side, apple cobbler for dessert. But when it’s time to pick up my little J from preschool, my mind turns to the things that he loves, those little treats that make him smile, making me smile. I may be getting Fall Fever (the September Floridian analog to the April Winnipegean Spring Fever) but that doesn’t mean I can’t make my guy an end-of-summer ice cream treat. 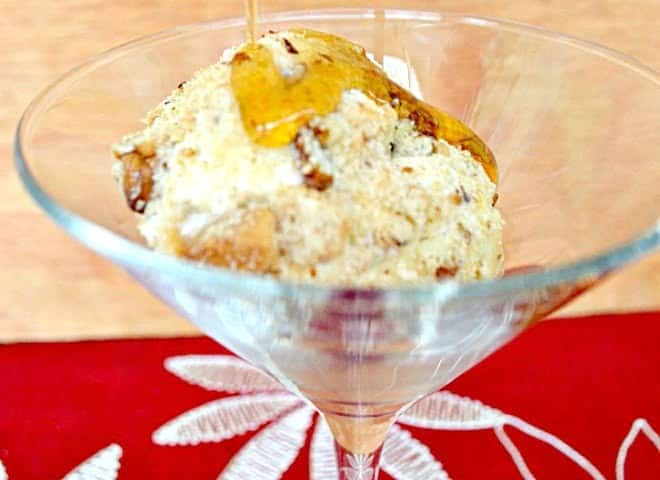 This ice cream balls dessert is made of ice cream, so it’s cold and refreshing. But with the coating of shortbread crumbs and pecans topped with a touch of maple syrup, it also manages to capture the warmth I covet. You need to work quickly when making these ice cream balls. My son’s little hands made it fun but were not the kind of help I really needed. Ideally, you would have a person with clean dry hands to repeatedly open and close the freezer for you, as opposed to a person with sticky little fingers who repeatedly throws cookie crumbs at you. Either way, these balls of cold autumnal flavours are worth the mess on any fall (or summer) day. 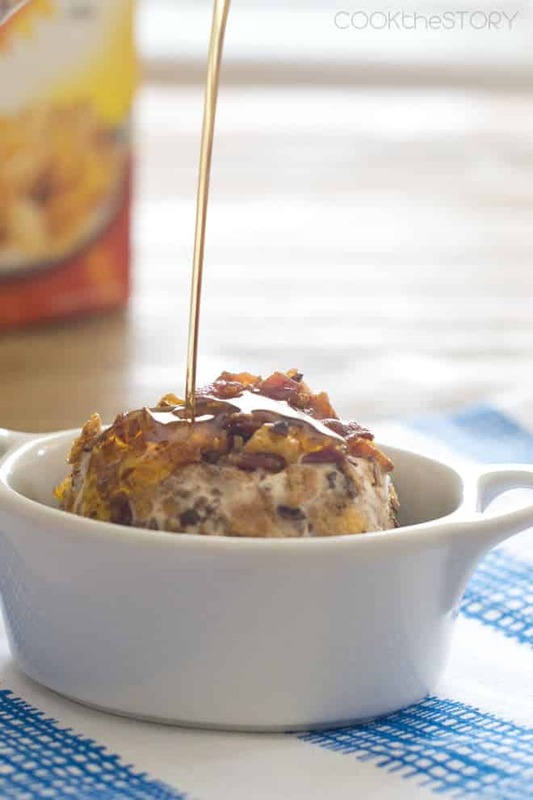 Oh, and if you like ice cream balls, you should also check out my cereal and bacon fried ice cream balls recipe. It’s dessert for breakfast! 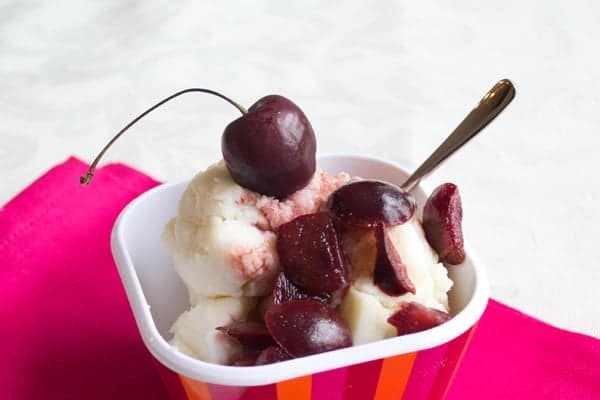 This ice cream balls dessert is made of ice cream, so it's cold and refreshing. But with the coating of shortbread crumbs and pecans topped with a touch of maple syrup, it also manages to capture the warmth I covet. Line a cookie sheet that will fit into your freezer with waxed paper. Lay it flat in the freezer. Combine the crushed cookie crumbs, pecans and salt on a dinner plate. Measure about 1/3 of a cup of ice cream onto a clean plate. Form it into a ball using your fingers. Quickly transfer it to the mound of cookie crumbs and roll it around until it is evenly coated. Get the cookie sheet out of the freezer, put the ice cream ball on the cookie sheet, return the cookie sheet to the freezer. Repeat steps 2 and 3 eight times then allow the ice cream balls to firm up in the freezer for at least an hour before serving. 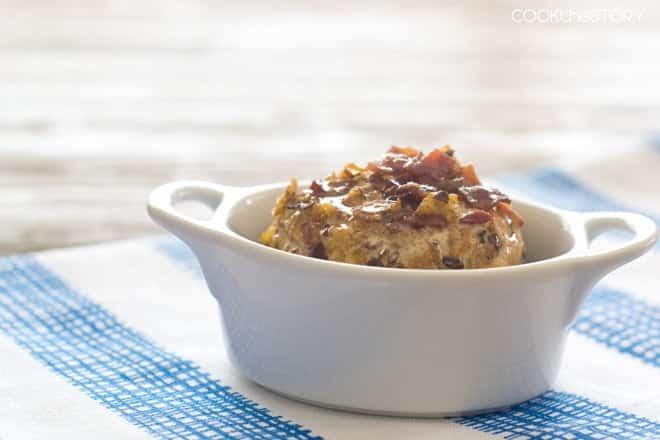 For each serving: Put one ball of crunchily-crusted ice cream in a serving dish and drizzle with 1 tbsp of maple syrup. 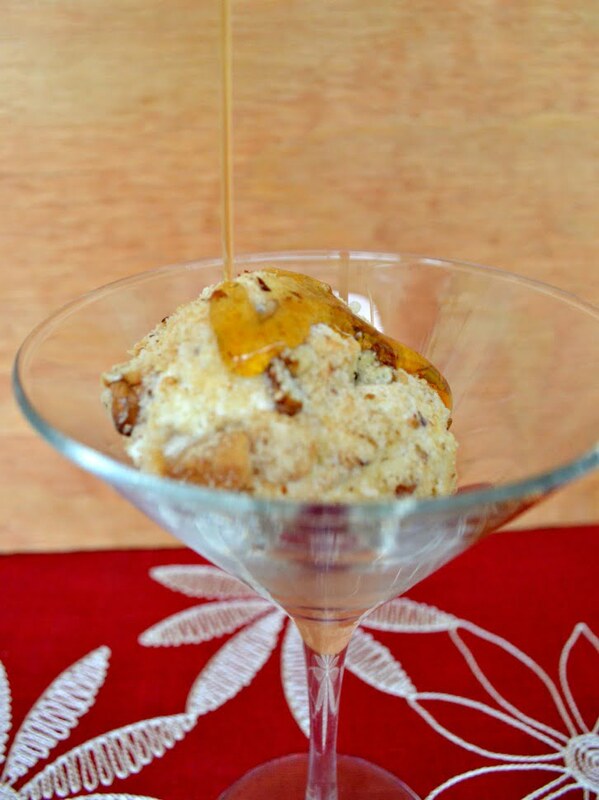 (If you're feeling extra indulgent, go with two balls of ice cream and 2 tablespoons of maple syrup. These look and sound super easy to make! 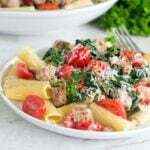 I can’t wait to give this recipe a try! 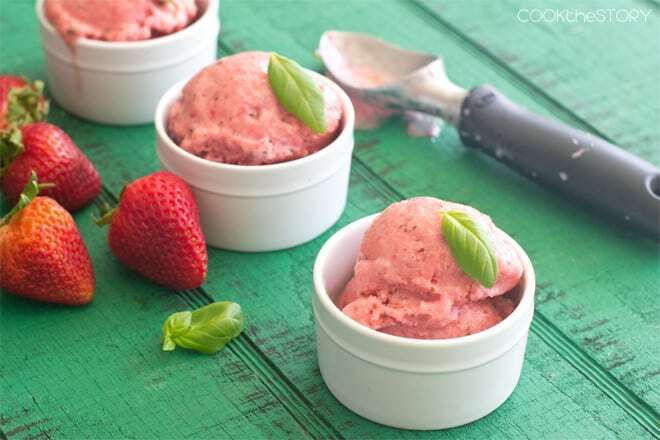 Thank you so much for joining in on Katie’s Cucina Virtual Ice Cream Social! I am sure this recipe is invented by you. 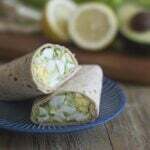 I liked it and I would like to make this recipe for my kids. 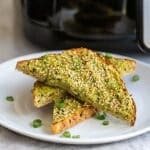 Can I use honey instead of maple syrup? My kids love honey and it would also be healthy for them. Honey is a little thicker in texture than maple syrup so it may not drizzle as well. But if you put a small dish of honey in the microwave just to warm it slightly (10-15 seconds) it thins out a bit and would then work perfectly. Thanks for the question! (And yes, this is my own recipe. Thanks for noticing :) ). I’ve never heard of this dessert before. Does it ever look delicious! Thanks Paula! 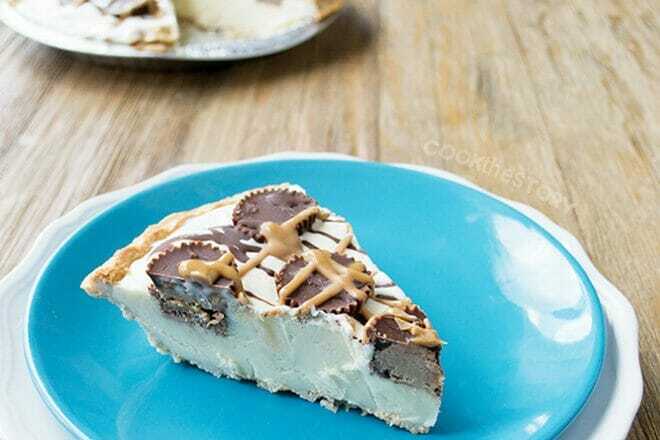 You can do any kind of cookie and nut combo and use different kinds of ice creams too. My husband’s fave is mint choc chip ice cream rolled in crushed oreos and drizzled with chocolate sauce. These look like a great flavor combination. Just this morning my eyes fell on the bottle of maple syrup in the fridge and I had the sudden urge to drizzle something with maple. Then I chided myself, because truly, fall will arrive soon enough here in NY. No need to rush, when summer is so short.